Tankstore Ltd. specializes in the manufacture of oilfield storage tanks – both single and double-walled. The size of these tanks range from small methanol tanks to 750 bbl production tanks. 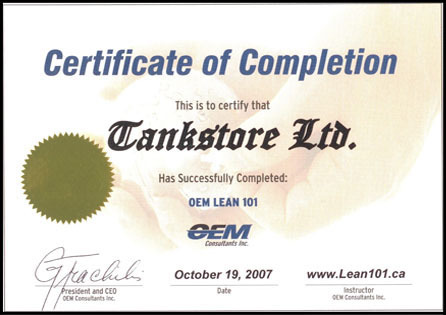 Tankstore Ltd. is a privately owned company established in 2001. All the partners have many years of background experience in the oil and gas industry. This knowledge has been incorporated into the design of our products, making them very functional and operator-friendly. Other Tankstore products include tank/separator packages, oil separators, testing unites, treaters, our G-55 Shallow Gas Production units, emission stabilizers, and our patented heating system. Tankstore is also an ABSA Code Shop manufacturing a variety of pressure vessels. Employees play a very important role in any company. All of our employees are local, living within 20 miles of our plant. Tankstore has a very low staff turnover rate and many of our employees have been with us since the beginning. Tankstore is committed to providing cost-effective technologically superior products for customers at a profit. Through ethical, responsive, and profitable actions our company will provide a safe and fulfilling work environment for our employees as well as excellent products and services for our customers while maintaining strength and support in the community. Lean manufacturing is changing businesses around the world through techniques that create outstanding results and translate directly into bottom-line profits. Lean Manufacturing centres around the Toyota Production System. The general idea is to eliminate any waste in the production system, as well as increase the flow of information and materials through the system. Sort through and sort out: Clean out the work area, keeping what is necessary in the work area, relocating or discarding what is not. Set in order and set limits: Arrange needed items so they are easy to find, use and return, to streamline production and eliminate time searching for them. Shine and inspect through cleaning: Clean and care for equipment and areas, and inspect while doing so. Standardize: Make all work areas similar so procedures are obvious and instinctual, and defects stand out. Sustain: Make these "rules" natural and instinctual. Once they are habits, the total benefits of 5S will be reaped. The system as a whole creates a workspace that allows for minimized waste. Not only do the five steps help to ensure that time will be spent doing more productive activities, but it also reduces the chance of error, rework and injury which are all high cost activities. Lean101 On-Line Course – Principles of Lean Thinking. 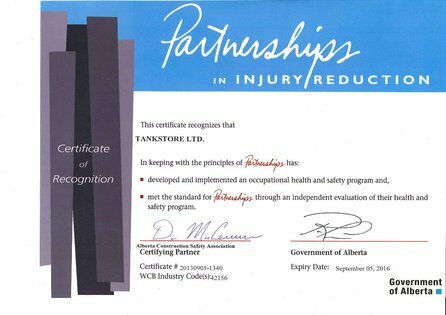 Tankstore holds a current Certificate of Recognition, we are committed to a proactive health and safety program aimed at protecting our staff, our property and our clients, as well as the general public and the environment from injury, loss or damages. 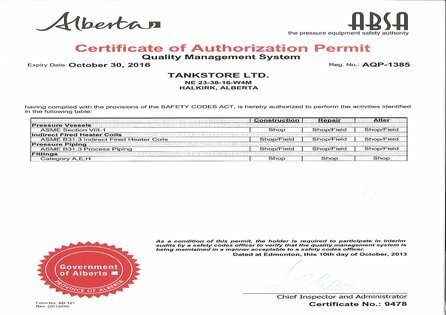 Tankstore produces equipment following the requirements enforced by the Alberta Boilers Safety Association (ABSA). ABSA is the pressure equipment safety authority for Alberta. ABSA administers Alberta's pressure equipment safety programs under the Safety Codes Act, and has the authority to enforce pressure equipment safety as set out in the legislation. By choosing an ABSA code shop the buyer is assured that the manufacturer is constructing vessels designed, fabricated, and inspected to a quality control system in compliance with a recognized safety standard. We have committed ourselves to becoming an organized, and proficient company. With our completion of the OEM LEAN 101 instruction, we have obtained our certificate of completion and now find ourselves more productive, thus saving the company and our customers money.